Get an original Portrait Drawing of your friends and family as Birthday gift or Birthday Invitation Card. One of our professional artists will draw your person from photo in black and white pencils style, so everyone will be surprised to receive such an original Portrait Drawing of yourself. We are ready to create your special portrait by pencil with high quality visualisation and design. We offer you a vast number of both Birthday gifts and cards ideas, which you can order in several clicks now. Hurry up! We offer reasonable prices for a pencil portrait drawing with worldwide shipping. Your Birthday Portrait will be delivered as a stunning looking, ready-to-be-printed JPG file of 4000px resolution at 300 dpi to your email. 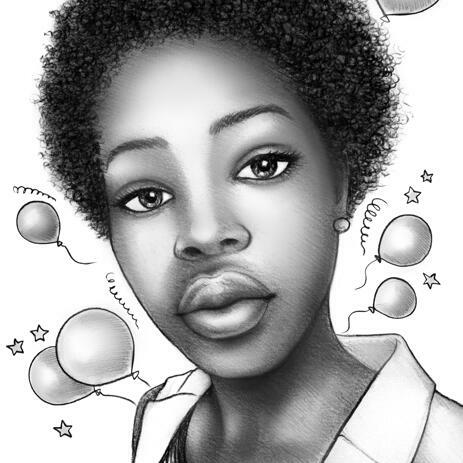 Seize our additional delivery opportunity: Birthday Pencil Portrait printed on Canvas, Printed Pencil Portrait on Photo Paper and Original Pencils Drawing on A4/A3 Paper.